c. toilet / waste pipes. 2. The door of the bedroom should not be facing a staircase, toilet door or kitchen. 3. Do try not to place potted plants or an aquarium in a bedroom or any paintings with water scenery. This is bad Feng Shui. The reason for not placing potted plants is because bedrooms are suppose to be a place for resting (yin) but plants are `living things' which continue to grow give off `yang energy'. 4. Avoid overhead beams that are above a study table or the bed. One remedy is to install false ceiling. This may not be feasible if it is too costly or the ceiling of the room is low. 5. Avoid `poison arrows' in the form of sharp edges, books which are like knifes that points to the bed! 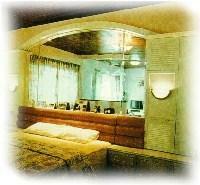 Majority of Feng Shui Masters said that it is unfavourable to have a mirror from any direction facing the bed. 8. Avoid having any glass panels or any opening on the roof of the bedroom. 9. The floor of must not be lower than that of the toilet. 10. Bedrooms must not have too many corners. 11. The bedroom door should not face a mirror. 12. Check to see if your bedroom door does not have a pointed decorative archway e.g. triangular shaped as it is a cause separation or divorce. 13. The bedroom door must not face the door of another room, toilet or immediately face the staircase. 1. It should not face the door of your bedroom. 2. It should not face another mirror or the bed. A wide view is good. Best that bed should be diagonally opposite the door. 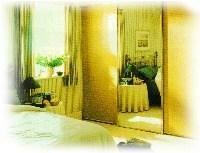 In the picture (see below), notice that even if there is a dressing mirror, it does not face any part of the bed. 1. It should not be placed below a beam. 2. The bed should be placed against a solid backing e.g. a wall. Your bed must also not be on the same wall as the bedroom door. 3. It should not face another bedroom door. 4. The bed should not face a mirror. 5. The bed should not be placed between two concrete posts/columns i.e. `sandwiching' your bed between the two concrete posts/columns. 6. It should not face a corner or toilet door. 7. The bed headboard must be placed against the wall. 8. It should not face a window overlooking a chimney. 9. It should not be moved when the wife is pregnant. 10. It is no good to use a circular (round) bed. 11. It must not be two single beds joined together. Get a full King sized or Queen sized bed instead. If two single beds are used, unfortunately they should be split up into two beds. No compromise here!